We welcome the new season of crisp breezes and colorful trees. Where leaves fall and the air is filled with pumpkin and spices alike. Every season has its special beauty and Autumn is no exception. We embraced this feeling by hosting our Annual Autumn Mixer on October 10th at the Downtown location on the rooftop. Celebrating 30 years of experience, AdvantEdge understands that the success of this company comes from our wonderful clients. 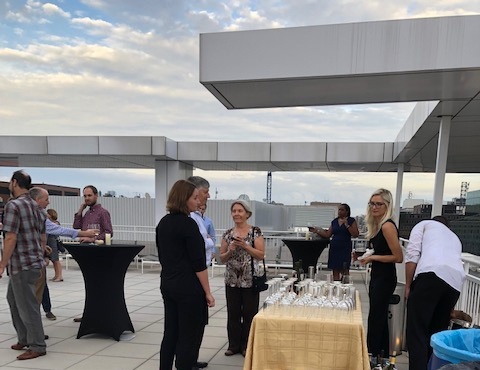 Under a beautiful sunset and charming city views, the Autumn Mixer was consecrated with Music, Wine and what became the talk of the night, catering from Rasika, Flavors of India. As everyone sipped, laughed, and ate to their hearts desire, the evening was filled with a sense of contentment. Clients and staff enjoying each other’s company outside of day-to-day business for an evening of pleasure was an essence of familiarity. The feeling you get when you are in the company of family and comrades. 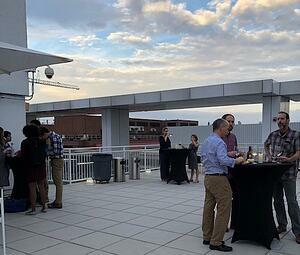 The night of the Autumn Mixer was a prime example that AdvantEdge Workspaces is more than a company merely providing office space and services alike. It is a place that serves its clients in more compacities than one. We take the time to appreciate each company and staff member for their contribution help this company thrive. The annual Autumn Mixer was nothing short of a "thank you" to all of our clients for being here to bring in another season together!